When we began homeschooling in earnest this past year, I knew that I wanted to keep things simple. I wanted each child's school books to fit into one basket and all of our daily supplies (not counting picture and chapter books of course!) to fit onto one bookshelf. As the year has progressed, I have found a few things that have made our way into our little school nook or our routine that have been very helpful for our family and have made it easier for me. 1. 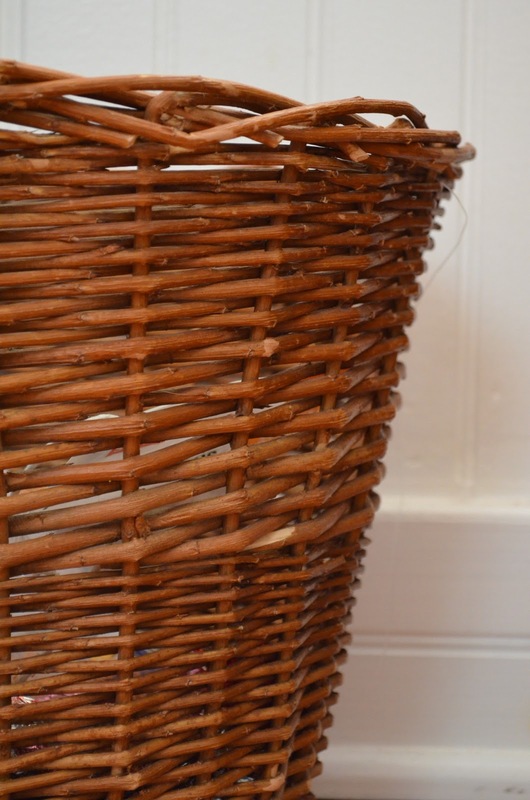 A Wastepaper Basket: This sounds very silly and obvious, I know. I did not have a garbage can in our school area and I noticed that things got chaotic and messy without one. Once I put one next to our work area, it eliminated the numerous trips we were taking to toss a piece of paper, dump, pencil shavings, and empty the dustpan. 2. A Binder: I have been using a binder to collect all of the bits and pieces of paper that are associated with learning at home and it has been nice to have everything in one place to refer to and use through our lessons and especially in preparation for our homeschooling review that takes place twice a year. 3. 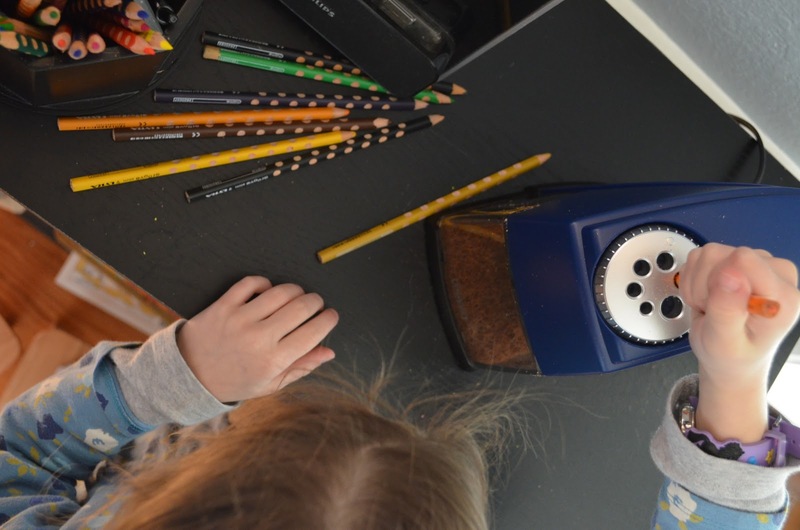 An Electric Pencil Sharpener: This is something that I hemmed and hawed about for a long time. It seemed to frivolous and unnecessary when we had two little sharpeners that are twisted with one's hands. This electric one has made things a lot easier. We were forever loosing the little sharpeners (or one of the two parts), the shavings were dumped all over the place, and it took a lot longer to sharpen pencils (and we seem to need to sharpen a lot). 4. A Daily and Weekly Tidy: This was a big help! The children and I tidy up the playroom on a daily basis (usually!) to keep everything in order. Sugar Plum and I try to keep our school books and supplies organized as we use them. Each week (usually Thursday), we dust, sweep, empty the wastepaper basket, etc. as we listen to some classical music. It is actually pretty enjoyable! 5. 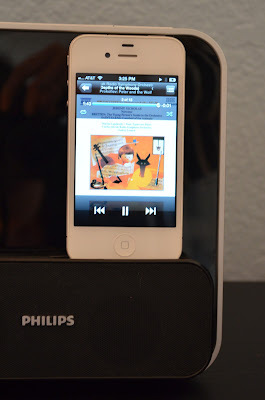 An iPod dock: Not too long ago, we realized that it would be easier to have a way to listen to music and audio books in the playroom. Our little ones like to listen to music and stories while they play and having everything in one place was a huge help. We already had this dock in our master bedroom (where it sat unused mostly) and I wish that I had thought to move it to the playroom much sooner! I know that none of this is rocket science, and likely all of you have thought of these things before! I feel a little foolish for even taking the time to write a post about such things, but I think that it will be nice to look back and see how things evolve for us as a homeschooling family. our electric pencil sharpener bit the dust and i splurged on one that has settings for various size pencils and it is SO fast and so good, it made me realize that sometimes paying a little more is worth it. It is amazing how something so simple can help so much, isn't it Monica? I definitely need an electric pencil sharperner; I keep thinking about buying one and then I forget when I'm at the store. I am keeping my lesson papers in a filing cabinet and everything more concisely in a binder.